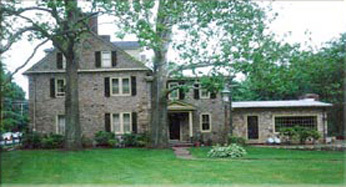 The Bridgetown Mill House in Bucks County in Langhorne, Pennsylvania was built as a private mansion in 1791. 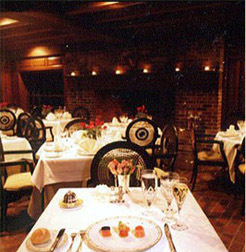 In 1998, this stunning Federal style building was transformed into a tiny luxury inn, and in 2003, the owners added an elegant fine dining restaurant. Having dinner at The Bridgetown Mill House is like taking a step back in time; the ambience is gracious, the décor attractive, and service is attentive by a knowledgeable staff. The dining room features intricate round back wood chairs, tables set with pristine white linens, sparkling crystal, cut flowers in silver vases, tea lights in glass holders, and classical music sets the mood. The room features three walls of windows, a rough stonewall, an oversized brick hearth, 1800s reclaimed brick floor, and a 1800s wood-beamed ceiling. 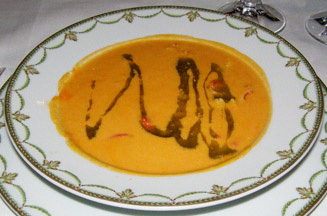 Edward and I had dinner at The Bridgetown Mill House in late March 2010, where on the night that we dined at the restaurant, there was a choice of a three course Innkeeper's Menu, Chef's Five Course Tasting Menu, as well as a la carte menu. 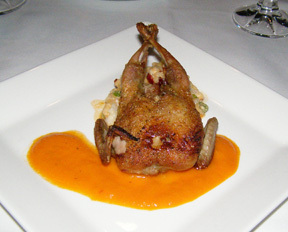 For his first course, Edward began with Roasted Quail with Chipotle and Cranberry Flavored Risotto, and Spicy Roasted Red Pepper Sauce, which was attractively presented on a square white plate. The quail was delicately golden and flavorfully enhanced with a sauce that had just the right level of heat to add interest without overpowering the quail. Paired with a glass of Shiraz, it was a lovely introduction to Chef Michael's Sujansky's style. 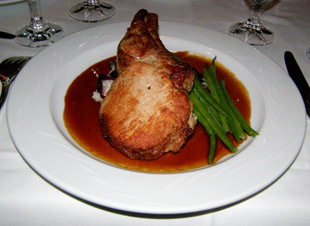 Edward continued with a second course of Pan Seared Pork Chop with Cranberry and Blue Cheese flavored Risotto, Braised Red Cabbage, Haricot Verts, and Port Wine Sauce, which was presented as a pork chop and sliced pork on a bed of risotto topped with haricot verts and red cabbage, with a rich pool of sauce surrounding the risotto. 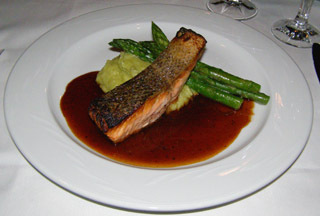 For my second course, I had Sautéed Atlantic Salmon with Basil Flavored Whipped Potatoes, Buttered Asparagus, and Bordelaise Sauce, which was presented as a strip of crispy skin salmon on a mound of whipped potatoes with asparagus spears heralding the new spring season, and a pool of sauce. Although the restaurant had lovely desserts on the menu, portions were generous, and we were more than satisfied with two courses for our dinner. The Bridgetown Mill House is open for Dinner from Tuesday through Saturday from 5:00 pm. 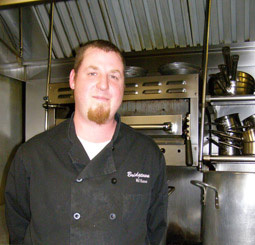 Read more about The Bridgetown Mill House in the Chefs' Recipes section where Chef Michael Sujansky shares a delicious taste of the restaurant with his recipe for Lobster Bisque .